So back when I was completing the ActionScript Image Effects book I was considering what I could do for fun to demonstrate some of the effects discussed in the book. I had a 3D library I had written years earlier that needed dusting off, so I thought I could combine the two tasks and create a 3D bobblehead toy that allowed you to apply and manipulate an image map to a 3D mesh which could then sit on your desktop and react to your mouse (which would also give me time to play with AIR, which I hadn’t really yet ever done to a great extent). And of course it practically named itself: AIRHead. But then I finished the book and went into a show, then was asked to do another show right after that, then, well, had a baby :). But I did work on it here and there and showed a first draft of it at RIA Unleashed last month. I’ve finally had a chance to finish up a 1.0 version and put together some help videos to explain it. 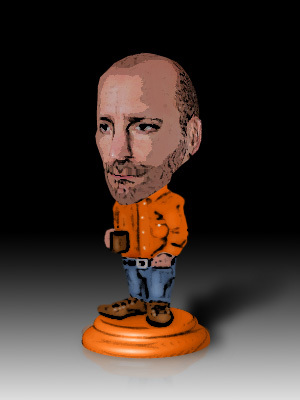 If you click on the above bobblehead of me you will be taken to an interface which does its best through a browser to demonstrate what the desktop application offers. You will find there a link to download the AIR installer as well if you want to take it for a spin and create your own bobblehead. Please post back with any cool creations or suggestions! Here are the slides and support files for the Image Manipulation presentation I gave at RIA Unleashed. I’ve also included the AIRHead application I demonstrated at the end of the session. At the present time the app doesn’t have any help or support files, though, so you have to play around with it to see what it does. I plan on writing up a more thorough post in the near future on the app, at which time I will put up some video demos of the interface (anything to get me out of typing up help docs — hey, it’s a free app! ). I entitled this first entry “I am not a blogger” and I’ve long thought just that as I watched blogs come and go around me while I played with the idea of starting one of my own. I had a fairly active website at 27Bobs in the early days, but over the past several years I’ve updated it less and less — I think once every 8 months was the average in the end. I am certainly not a daily, weekly, or now even monthly updater, so having a blog just seemed silly for me. So, why now? Well, first, I am finishing my fifth year at Brightcove in Cambridge, MA, working primarily on the user-facing front end for our service, the media players, along with the templating system for creating them and the Flex application for managing them. We do some pretty cool stuff in that area and there’s a lot of functionality in our players that just hasn’t been tapped yet or showcased. Hopefully with this forum I can provide some insight and answer questions for those currently developing. I also saw my first full book, Foundation ActionScript 3.0 Image Effects, published this past Spring by friends of ED. I thought having a site that could support that book outside of the friends of ED forums would be helpful (if a little belated at this point). In that book, I present two open source libraries I wrote and use all the time, aeon animation and aether effects. I’d like to delve into these a bit more using this blog as well. Finally, there is a rare occasion when I still get to do something in Flash just for fun and to experiment with features I might not get to explore much at Brightcove, and I will present those pieces here when I can. One example of this is AIRHead, a desktop bobblehead toy created for AIR using my custom UI, 3D, effects and animation libraries (you can see an image of one of the creations in my header above). I will be making this available for download shortly along with the slides and files from my presentation at RIA Unleashed where I spoke about ActionScript image manipulation and demonstrated AIRHead for the first time. So we’ll see where this blog thing goes. Stay tuned.